When and where Alma and Max met and married is unknown but they were married by the early 1900s, as a postcard to them was found in a collection of postcards of Max Müller II. 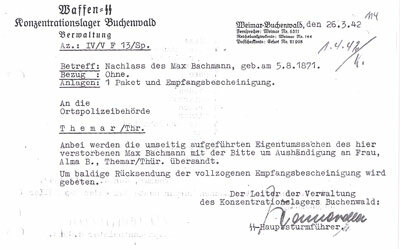 (Max had taken charge of Max Bachmann’s few belongings upon his death in March 1942.) At that time they were living in Spandau in Berlin. Although we have no formal records, we are quite certain (99%) that the Bachmanns had a daughter, Sophie or Sofia. 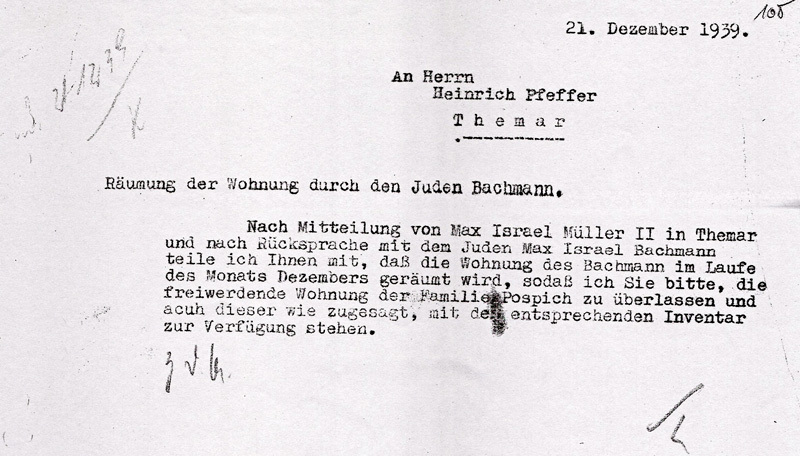 Oskar Stapf’s 1962 list of the “Jews of Themar from 1900 On” has “1 Kind/1 child” against the Bachmann name. In Themar, several eyewitnesses recall that the Bachmanns had a daughter who lived in Berlin. Source: The H. Müller Collection. Another trace is found in a postcard (at right) in the Max Müller II collection, from Walter Bachmann in Morocco to his uncle Max, in 1932. He sends greetings to his aunt Alma and “dear Sophie,” an additional trace. In a letter to Willi Müller, who emigrated to Palestine in 1938, his parents, Max and Clara Müller, asked if he had made contact with Sofia [their spelling] who was also in Palestine. Why and exactly when the Bachmanns came to live in Themar (about 500 km south of either Pyritz or Münster) but the best guess is that they came before WWI. The first trace of them in Themar is the ad at the right in the December 1913 local newspaper advertising for help for Mrs. Bachmann. They rented living quarters at various addresses in Themar including Schulstrasse 334 right in the heart of the city. Later they rented an apartment at the building owned by cabinetmaker Schieppel at Schlagetererstr. 11 (Römhilderstrasse) on the road to Wachenbrunn (see map). Max is identified as a ‘Kaufmann’/merchant in the Nazi records of the 1930s and Alma as a house wife. When the Nazis took power in January 1933, Alma was 59 years old and Max 62. 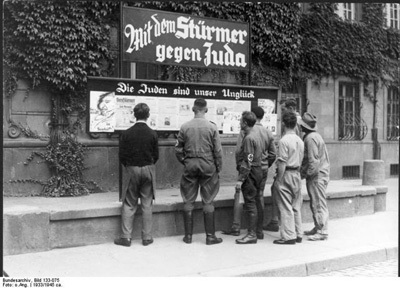 Citizens reading Der Stürmer in open display windows, Worms 1933. Source: Deutsches Bundesarchiv/German Federal Archive, Bild/Picture 133-075. Max immediately attracted the attention of the Nazis; according to Manfred Rosengarten’s account, Max had a “habit of coughing and spitting. Once he did this in front of the city’s display box of Der Stürmer, the Nazis’ antisemitic newspaper. He was arrested and charged with something like insulting the Nazi Party. He got off because enough people testified that he always coughed and spit without thinking. For people to do this,” Manfred remembered, “was rare in those days” — other eyewitness statements confirm his account and opinion. Max’s luck did not continue: in the 1938 November Reichspogromnacht (known as ‘Kristallnacht’), Max, aged 68, was rounded up with the other men of Themar and hauled off to Buchenwald. Max was released by the beginning of December and while, there is nothing in the official records to indicate that the Bachmanns attempted to emigrate, it seems possible that they did attempt to leave. In one of their letters to son Willi in Palestine, Clara and Max Müller tell him that the Bachmanns are trying to make arrangements to leave Germany, presumably to go their daughter in Palestine. Source: City of Themar Archives. 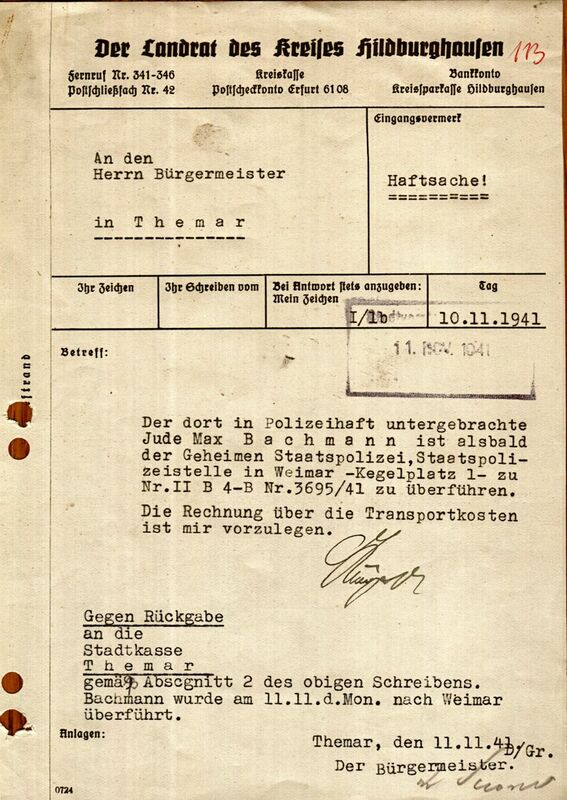 In December 1939, the SS forced the Bachmanns to move in with the Frankenberg and Sander families at Strasse des SA 20. [The document at rights says that the leader of the Jewish congregation has informed the City that “the Bachmanns will leave their apartment by the end of December.” Every day their living conditions worsened — both Bachmanns were ill and had to beg repeatedly to receive medical attention. 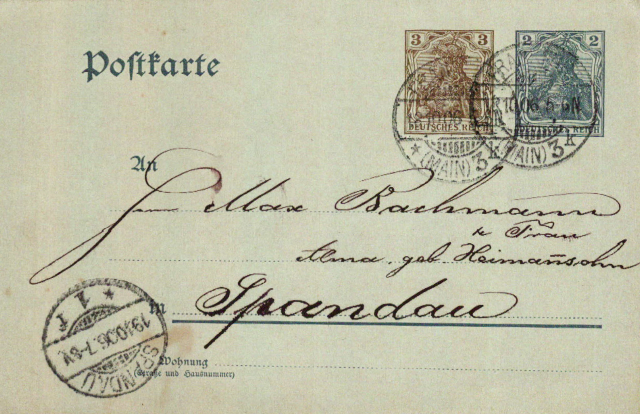 Since the gassing of German Jews on German soil was conducted in highest secret, the authorities maintained the façade that Max had died in Buchenwald and the SS at Buchenwald sent a pathetic bundle of his belongings back to Themar on 26 March 1942: “Enclosed is the property of Max Bachmann with the request to give it to Frau Alma B. Please return signed receipt as soon as possible.” They did not know that Alma Bachmann had not survived her husband’s rearrest and had died just over two weeks later on 27 November 1941. If you have any information or questions about the Max & Alma Bachmann family, which you would like to share, please contact Sharon Meen @ s.meen79@gmail.com or smeen@mail.ubc.ca. We would be pleased to hear from you.